Happy Tuesday! 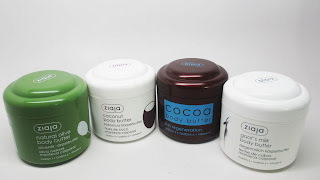 Thank you to everyone for participating in my Monthly Favorites giveaway for the Ziaja Body Butters. Congratulations! Email me by Friday at midnight to claim your prize or it goes to someone else! I think i'll be making this monthly favorites giveaway a tradition. Thanks to everyone for participating, Ciao Bellas! FTC Disclosure: Products sponsored for giveaway. I am not affiliated with this company and not paid to write this post. These are my honest thoughts and opinions. This is a effective website on www.blogger.com.This is website many many everyone help for us.It is very good website.So nice,this is a nice post.I also want to show about on Click-n-earn Get Compensated Paid to click advertising and view sites, Get Compensated To Improve, Buy Cost-effective Banner Marketing PTC Marketing Email promotion, Cost-effective ad Marketing, Cost-effective PTC Marketing, Produce Cash On the internet, ways to make online, Get Compensated For Website Strikes work from home USA And More. Try It Out Today! Awesome giveaway. Congrats winners. I hope to win next time.